Ahhh the Super Moon… well please go away. The fishing has been decent but the super moon has made this week a little more changeling. This past week I have been offshore fishing for snapper, grouper and kingfish and I have been in the backcountry fishing for snook, redfish and trout. The offshore bite was a little tough based on the super moon keeping everything feed at night and I tend to fish during the day…lol. We did manage some nice Mangrove snapper up to 3 pounds and a few small grouper along with some very nice Spanish mackerel. We have had a small run of red tide in patches along the beaches and that may have had something to do with the poor bite as well. My inshore trips have been producing some nice snook and redfish along with some decent trout. The baitfish have still been present but only time will tell how long they stick around. So far the trips that have produced any numbers have been using live Pilchards and using them to chum up the snook and redfish. 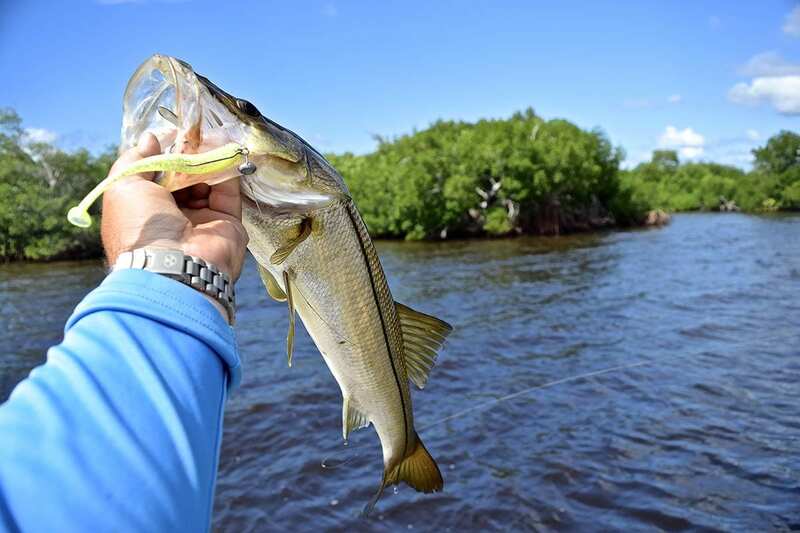 That being said, we have had a few solid days using topwater plugs to entice those snook and reds on the flats. I have been using several Rapala Twitching mullet and twitching minnow, I like the single hooks that come with those baits and they have been producing well. We have also caught several nice snook and redfish on small 4″ paddle tails rigged on the Articulus Jig Head. Just bouncing the bottom or steady retrieve seems to be doing the trick.